While we wait to kiss the new year in, there is still a lot to be done. Especially if you’re hosting a party for a few friends as Mrs. E. and I do every year for our anniversary. This year we have had sixty-five acceptances, fourteen regrets and a dozen or so un-accounted-fors. 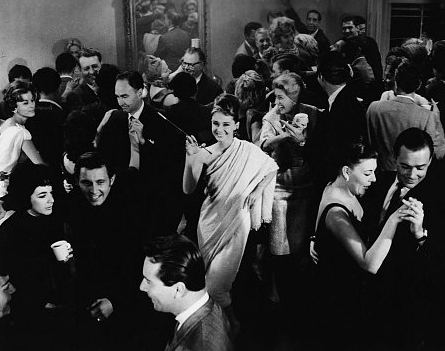 Clearly this is one of those parties that requires a little planning and preparation, unlike Miss Golightly’s. I am of the firm belief that the only way to enjoy a party is to have the time to properly prepare to receive your guests. Which means time to mix a dressing drink, shower, shave and dress. So what’s a harried father of two to do in between the spate of visits from family and friends, the short-order cooking and the children’s relentless demands for attention? Panic, you might say. Panic, in my case, leads to having to start well in advance. Today we will run multiple loads of appetizer plates and stemware through the dishwasher, polish the silver and my shoes, and pick up the frighteningly huge collection of Christmas toys that the children have amassed. Step one in your Easy and Elegant Life Party Planning Guide. This entry was posted in Entertaining and tagged New Year's Eve, party planning. Bookmark the permalink. Oh, I do love to throw a party. Have so much fun – and, aren’t the unaccounted fors annoying? Not the people themselves, just the mystery. That’s a great acceptance rate, though planning for some number of non-responders is always the biggest challenge. Our pre-holiday fette garnered quite a few regrets on what I believe was the high-holy-day for holiday parties, but managed to make a 110 person list a more manageable 50 guests. I do love to give a party!! Have a glorious time! Post-Christmas parties are so great–a nice way to stretch the festive feeling and ease into the post-Christmas let down! For recipes that can be prepared in advance, we swear by Ina Garten– And for flowers, paperwhites are so elegant (and EASY), especially in the powder room and entry way, as they make a whole room fragrant! Can’t wait to hear all about this soiree! you crack me up !!! i chose the same pic for my xmas party post. i put santa hats on a few of the party guest . AUDREY however, is the absolute bomb ! happy new year …. you handsome devil !